The North Wall in South Parade is a purpose-built arts centre which opened in 2007. Created from a former Victorian swimming pool, the centre has won several national awards for its innovative design and comprises a 200-seat theatre, an art gallery, and two studio spaces. 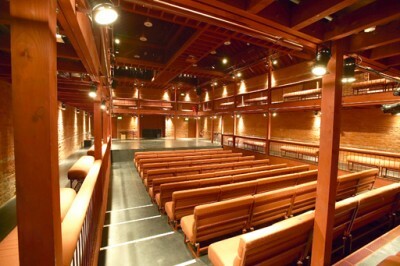 The North Wall aims to fill a gap by offering an alternative to the mainstream, introducing Oxford audiences to a vibrant programme of award-winning theatre, dance & opera: shows that require intimacy as well as shows that have a large-scale ambition but fit into the theatre's flexible space. Previous performers include Shared Experience, Out of Joint & 1927. The venue has also welcomed top comedians such as Sarah Millican, Julian Clary and most recently Eddie Izzard, and continues to play host to Britain’s brightest up-and-coming stand-up stars. The programme also includes shows for families, contemporary and classical music, cabaret, and new exhibitions in the modern, light-filled gallery every three weeks. You can view the full programme and book tickets on the website. Some of this season’s forthcoming events are shown below.